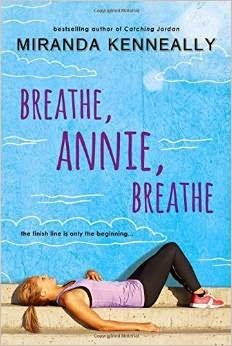 This is a book review for Breathe, Annie, Breathe by Miranda Kenneally. I received this ARC from NetGalley in exchange for my honest review. Annie hates running. No matter how far she jogs, she can't escape the guilt that if she hadn't broken up with Kyle, he might still be alive. So to honor his memory, she starts preparing for the marathon he intended to race. But the training is even more grueling than Annie could have imagined. Despite her coaching, she's at war with her body, her mind-and her heart. With every mile that athletic Jeremiah cheers her on, she grows more conflicted. She wants to run into his arms...and sprint in the opposite direction. For Annie, opening up to love again may be even more of a challenge than crossing the finish line. First of all, I want to say that this book was not nearly as heavy as I thought it would be. A story about a girl running in memory of her dead boyfriend just screams tearjerker to me. I also thought the romance would be the main part of the plot. I am happy that I was wrong on both counts. Yes, there were a few emotional moments. But for the most part, this book was about Annie moving on and pushing herself towards a bigger goal. I really admire her for her dedication to run the marathon. I am one of those people whose muscles are just not built for running. Annie kept pushing herself and all the workouts and planning allowed her to do more than just sit at home and grieve. It was during her training that she meets Jeremiah. I absolutely loved his character. And I loved their chemistry and flirtatious banter. I found myself smiling during some of it. There was no insta love here. Well . . . there was one hookup very soon after they met. Annie was still grieving and she was lonely. Annie then realized she wasn't ready for a relationship and told him she just wanted to be friends. I am sure I am not giving away any spoilers to say that is not how their story ended. I enjoyed watching their friendship develop though and it was a lot more realistic than watching the fall in love after their one hookup. They actually hung out together with very little physical contact. I was anxious waiting for Annie to realize that Jeremiah was worth the risk. I think the only negative for me were Jeremiah's issues. He was bit of an adrenaline junky and just kept doing stuff that was more and more dangerous. I was as scared about this as Annie. After losing her boyfriend, she did not need someone that she was constantly scared she could lose. But Jeremiah changed a bit after Annie. He did retain some of his need for risk, which encouraged Annie to put herself out there a bit more. Buy/Borrow/Skip: Buy! This was a light, yet heartwarming, read. Nice review! I really enjoyed this book as well, and it made me want to catch up with some of the author's earlier books. Thanks! Yes, I want to read the others by this author as well. I must admit, this book hadn't really been one I had wanted to read. Mostly because I also hate running, but it isn't so much my muscles that rebel, it's my lungs. But Annie hates running, but is doing it in the (ex? )boyfriend's memory? That's kind of sweet. And I mean, I can relate to hating it, that's for sure! Plus, I could use some light and heartwarming in my life :) Great review! Thanks Shannon. I am not a runner either. I have tried, but I just found it exhausting. Plus, my knees can't take it. Ha. Yeah, Annie was not super into fitness and she had never run at all until her boyfriend dies. But the running and all the training gives her something to focus on besides her grief. Spoiler alert: she does end up enjoying it. :) This is a great read, even for those who don't like running! I thought exactly the same, I was expecting heavy but I was pleasantly surprised. I loved all the running bits! Thanks Trish! It was surprisingly light. But after the heavy stuff I have read lately, I was happy with it. I really loved this book too. And I could definitely relate to Annie's hate for running! LOL! Bout of Books 13 Sign-Ups! Books and Bloggers Swap Show Off! Top Ten Tuesday - Favorite Authors! Top Ten Tuesday - My Favorite Quotes! What slump? Let's look at pictures instead! Books and Bloggers Swap Sign Up Post! Friday Memes - Black Iris Fever!